Marshall Welch served as the Assistant Vice Provost for Community Engagement at Saint Mary’s College of California. Prior to that, he was the Director of the Catholic Institute of Lasallian Social Action (CILSA) overseeing service-learning and social justice programs at Saint Mary’s College. Marshall began his work in the field of community engagement by teaching service-learning courses at the University of Utah as a tenured full professor, where he later became the Director of the Lowell Bennion Community Service Center. In 2003 he hosted the third research conference on service-learning and community engagement in Salt Lake City prior to the establishment of International Association of Research on Service-learning and Community Engagement (IARSLCE) and has served two terms on its board. Marshall also took a leading role with Campus Compact in conceptualizing leadership institutes for new center directors and hosted the first one at the University of Utah. 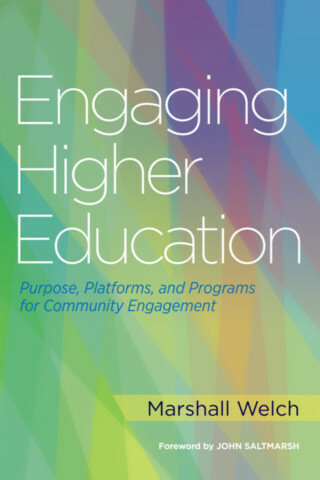 In addition to writing numerous articles and book chapters in the field, he is the author of Engaging Higher Education: Purpose, Platforms, and Programs and the co-author of The Community Engagement Professional published by Campus Compact and Stylus Publishing. His recent work has been researching campus center infrastructure to advance community engagement leading to the creation of the National Inventory of Institutional Infrastructure for Community Engagement (NIIICE). He is now an independent scholar living in the Portland, Oregon area. Learn more about Marshall Welch on his personal website, www.marshalljwelch.com. Using a conversational voice, the authors provide a foundation as well as a blueprint and tools to craft a community engaged course. 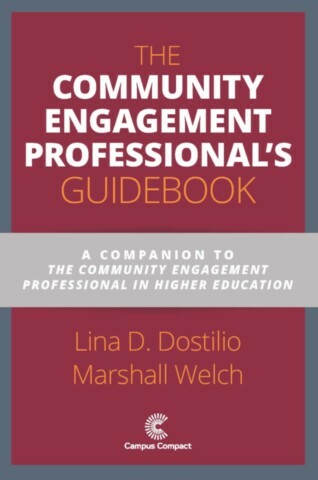 Based on extensive research, the book provides a scope and sequence of information and skills ranging from an introduction to community engagement, to designing, implementing, and assessing a course, to advancing the craft to prepare for promotion and tenure as well as how to become a citizen-scholar and reflective practitioner. An interactive workbook that can be downloaded from Campus Compact accompanies this tool kit with interactive activities interspersed throughout the chapters. The book and workbook can be used by individual readers or with a learning community.